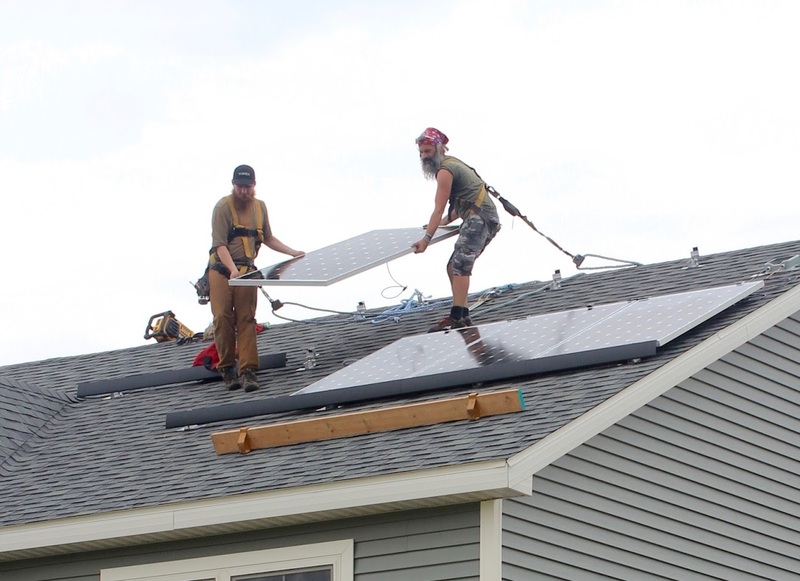 By the end of this year, nearly 100 Wisconsin households will become owners of new solar PVsystems on their rooftops as a result of four group purchase programs initiated in 2016. The communities served by these programs are Milwaukee (and neighboring Shorewood), Madison, Racine and Eau Claire (see table below). Solar group purchase programs are designed to reduce the cost and complexity of installing solar panels on individual houses. In a typical solar group purchase, a city and/or a community organization works with a single contractor to simplify the site assessment, permitting, installation and interconnection process at a preset price to interested households. By organizing these installations in a single package, the contractor is able to acquire equipment from suppliers at a discount, and pass the savings to the group program participants. Individual households are invited to attend meetings in and around the community, where they can gather information about the program offerings (including incentives and financing options) and arrange for a free site assessment. Though not new in Wisconsin, solar group purchasing is having a breakout year this year, due to the convergence of several factors. - A judicial decision in October 2015 that invalidated an onerous solar connection charge in We Energies’ territory. The judicial reversal arose from a lawsuit filed by RENEW and The Alliance for Solar Choice challenging We Energies’ solar charge, which was approved by the Public Service Commission in November 2014. It is hard to overstate the importance of that court decision, since more than 70 of the nearly 100 households participating in community group purchasing programs are customers of We Energies. Had that solar connection charge taken effect in January 2016, the cost of going solar would have risen by 30% in We Energies territory. 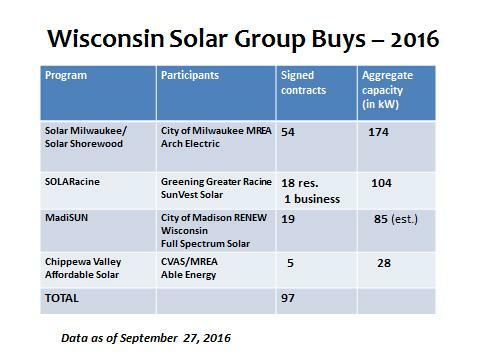 Wisconsin's two largest cities are running their solar group purchases through their respective Solar America programs (Milwaukee Shines and MadiSUN). Milwaukee is partnering with Midwest Renewable Energy Association while Madison has paired up with RENEW. In contrast, local solar enthusiasts such as Tom Rutkowski in Racine, and Steve and Ellen Terwilliger in Eau Claire, took the initiative in organizing SOLARacine and Chippewa Valley Affordable Solar, respectively. Chippewa Valley Affordable Solar, the newest of the four programs to get off the ground, is set to continue operating through 2017. The MadiSUN program is likely to field another group purchase program next year as well. It is clear that the group purchasing model works in Wisconsin and it is our hope that the successes in 2016 will spur community or environmental organizations elsewhere in Wisconsin to launch similar initiatives in their back yards.